Remember when you were younger and there was one phone in your life? I mean like one number that was for the entire household? This will apply to almost every person reading this posting with a few exceptions because of age of course. The phone was something that we used very little for the most part for one reason and one reason alone, it was not in our pocket or attached to a speaker system in our cars or our ears. I can remember coming home from a long day of playing with my friends and having my mother tell me that one of my friends had called and I was so excited! I would rush to call them back and if I reached them there was so much satisfaction in it. The other side of the coin however, was that I didn't always get them due to that nasty busy signal! I still can remember that call waiting was not a necessity back then. Cut to the present moment. As I walk streets of NYC daily, the new status quo is head down and text vigorously. So how can you see what is coming in your direction if your head is down for 4 blocks? I mean on the most basic level, what about moving cars that will inevitably meet you at every corner as you are walking? I actually see people almost walking into each other while sending a text. On top of that, I have to also bring up the text messages sent while on a bicycle! Now just visualize that for a moment. A girl or guy on a bike looking down and sending a text while looking up maybe every 2 to 3 seconds. How long does it take to get into an accident? Let's go with a millisecond just for kicks!!! That was just my intro to the real reason why I wrote this post. We are truly losing contact with each other day by day. The human interaction has dwindled in a major way. When we are in contact with others either at dinner, in a store, or even in hospitals, the cell phone takes precedence. If you watch a room full of diners during any meal of the day, you will find the cell phone close at hand. So how did we get here? How can we possibly believe on a consistent basis that the text or call coming in is more important than the time we are spending with a loved one or even a business associate? We owe it to ourselves to look people in the eyes and truly value our time with them. 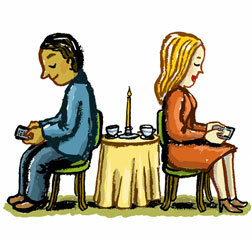 When was the last time you had a complete meal with someone that did not get interrupted by a cell phone call? Just something to think about. As I have become more aware of this simple action of switching my phone on silent or even off during my time with others, I see things differently. Just recently I made a good friend of mine aware of the fact that she was constantly looking down at her screen and leaving the table or straight up talking while we were together in large amounts. As you can probably guess, it did not sit well with her. She did not feel that she was doing that as much as I said and she felt that it was harmless in the grand scheme of things. The remainder of that talk was rocky, but I finally got my point across that I take my time with the people that I care about seriously and that I had been making a conscious effort to be ""present"" as much as possible. That doesn't make me right or better, I just stated my perspective. In closing, ask yourself, is that call coming in life threatening or crucial to the direction of the next hour of your life? If the person across from you were to pass away, who would you miss more? The person who's call you took or the person who you no longer have the luxury of speaking to anymore. You give up the luxury of speaking to someone when the cell takes the front seat. I know, I went deep on that one. Electronics from cell phones, ipads, and so many other gadgets are separating us in a rapid fashion. So the next time you are with the people that you care for and there is the option to give them your full attention, take the opportunity and run with it! A person who truly feels that you are engaged in what they have to say will respect you for years to come and you will deposit karma into your account that you will reap the benefits from forever. Instill a little cell block into your lives!!!! Presence is truly magic!! In fact, more presence brings more presents. Work with that one!! !